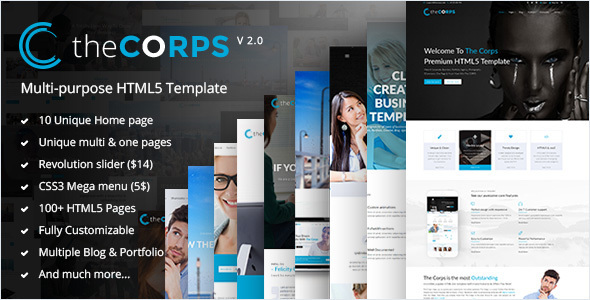 the Corps is an exclusive multi-purpose 100% responsive template with powerful features. Simple and well-structured coding, high quality and flexible layout, scalable features along with color schemes to create tailor-cut websites. With bootstrap, responsive mega menu and various layouts including incredible blog themes, the Corps offers you unfathomable accessibility to build beautiful and customer-oriented websites. Unique designs, eye-catchy portfolio and innovative website building tools work seamlessly to boost your business online. This template is designed for all types of businesses such as Corporate, Business, Portfolio, Creative, Blog, Agency and many more… Customize according to your business or client requirements with the ultimate features.